Did you know that field courses have been organized in Seili since the 1960s? 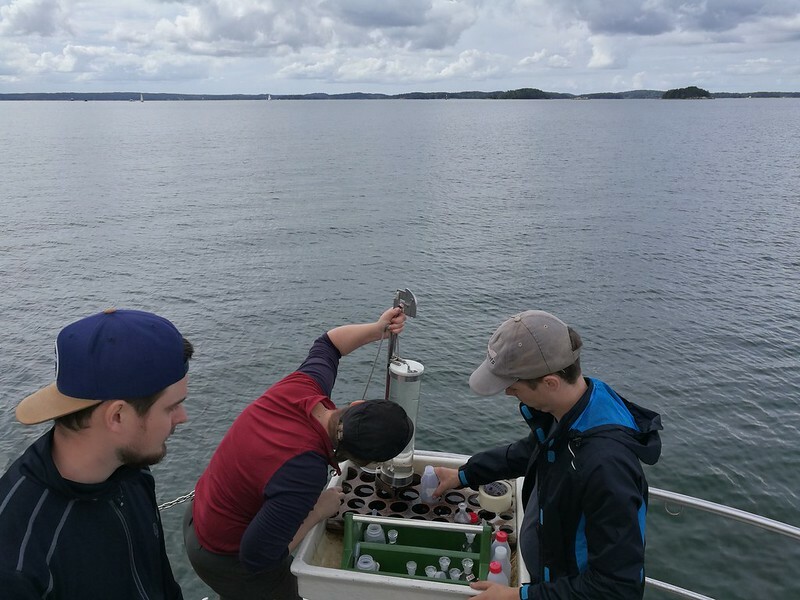 This week undergraduate biology and geography students from the University of Turku arrived to Seili to learn about the special characteristics and ecology of the Baltic Sea and Archipelago Sea. During the course week, students participated in sampling cruises on board of the Institute’s vessels r/v Aurelia and Seili 5 and conducted several laboratory exercises.  The course has been organized in its current state since 2003 and is teached by the staff of the Archipelago Research Institute. Here’s a photo roundup of the course week. 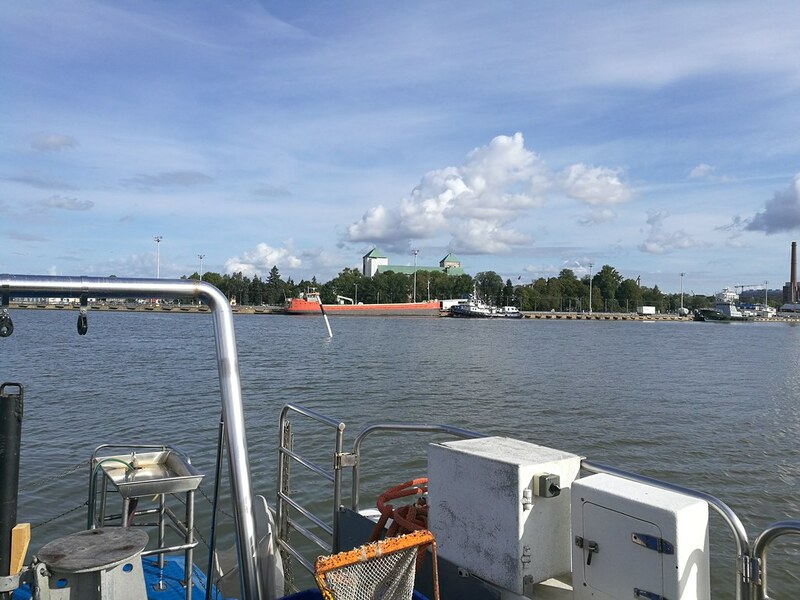 After the introductory lecture at Turku University campus, it was time to start the first sampling cruise from the Aurajoki River. At 10:00 sharp, we embarked on our research vessel r/v Aurelia and headed toward the first sampling point just outside the Aurajoki river. 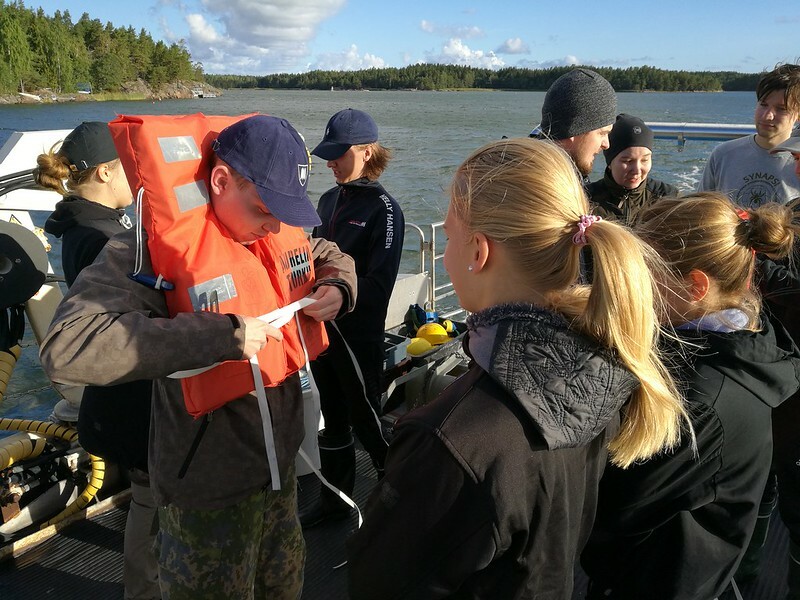 At Linnanaukko (named after its proximity to the Turku castle), the students got to observe the river’s effect on Secchi-depth, salinity, water temperature and bottom macrofauna. The sampling cruise continued along the Airisto inlet towards Seili island. 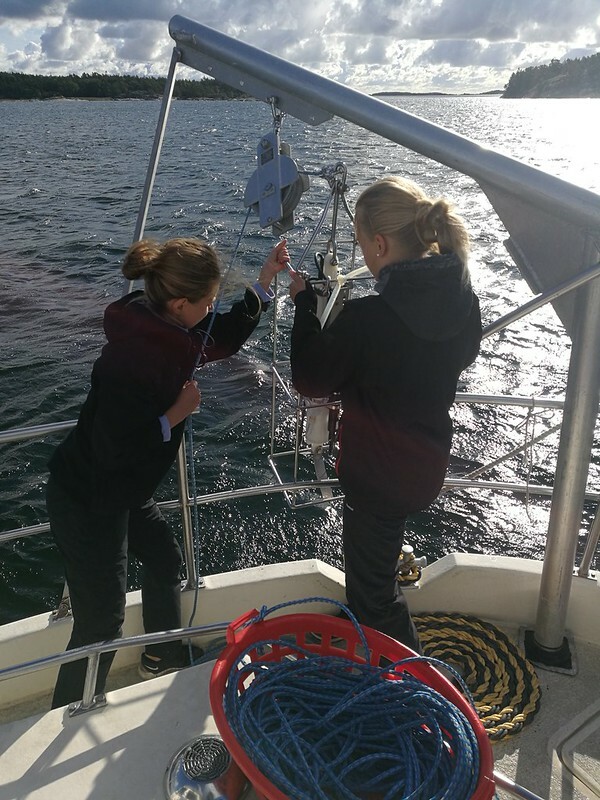 The water quality (temperature, salinity and oxygen content) was monitored with water samples, collected with a Limnos-water sampler as well as with a profiling CTD-sonde. On Monday, our journey was favored by the weather gods and the students were able to practice their sampling skills in calm and idyllic weather. Thanks to the good weather, we arrived to Seili on record time! 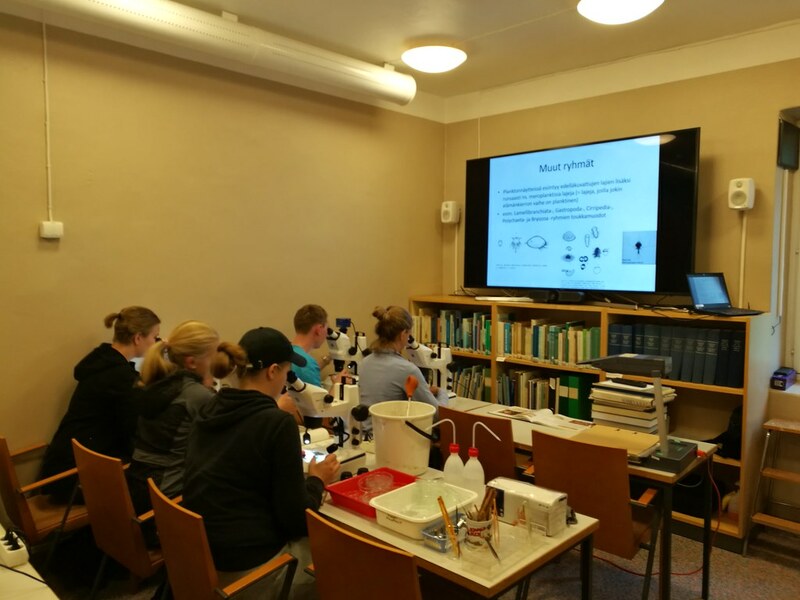 Nevertheless, this meant no extra free time for the students as the day continued with an introduction to common Baltic Sea zooplankton species. The Institute’s new seawater laboratory was put to the test and found perfect for these types of exercises. On Tuesday, we embarked r/v Aurelia again at 08:00 and headed towards the outer archipelago . Weather forecasts showed heavy winds for the day so an emergency training exercise was in order. Marine research can sometimes be very laborous. Lifting the CTD-sonde, tied to a metal frame, from the 100 meter depth of Ådofjärden equates to a workout! During the first two days several bottom sediment samples were taken with Ekman and Van Veen sediment grabs. 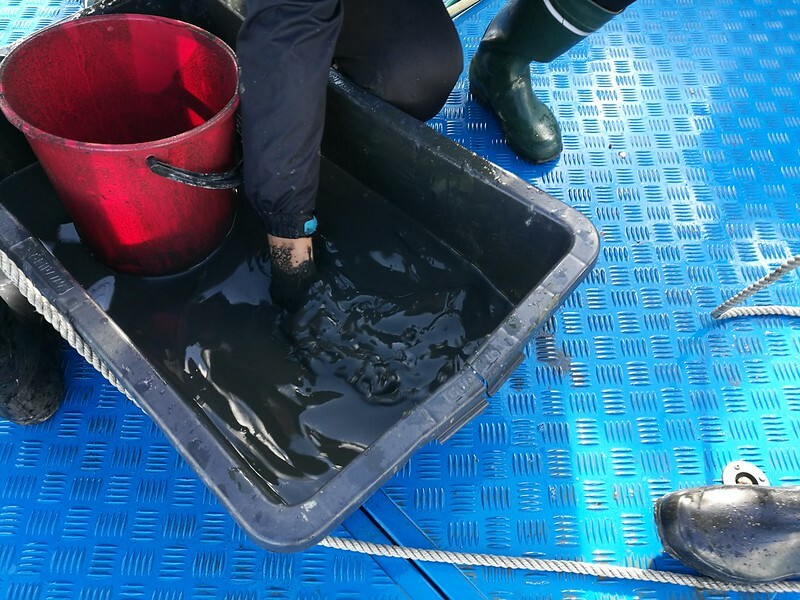 Preparing the samples for sieving is also known as “mud-therapy”. Sometimes there is no choice but to change the course program due to apparent weather conditions. 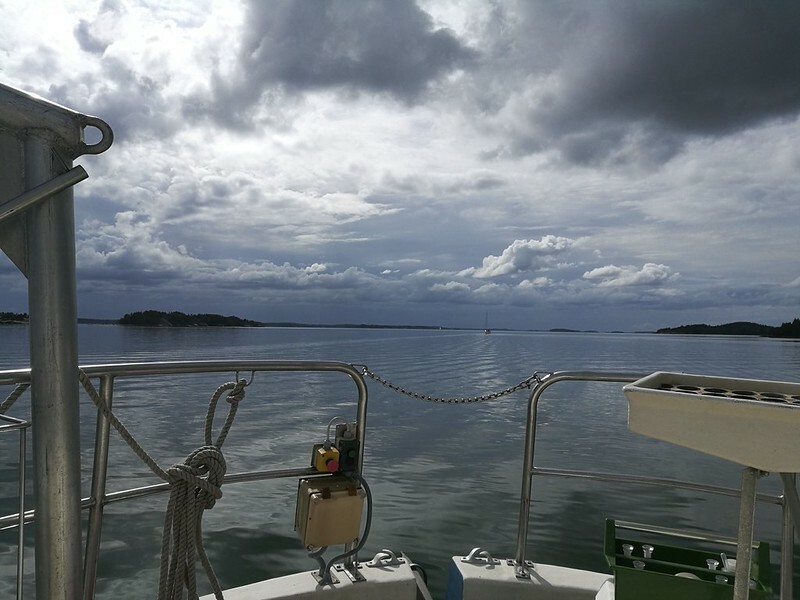 The heavy wind speed (11-12 m/s) forced us to skip beach seining at Boskär-island and we headed toward Seili a bit earlier than anticipated. But no worry! 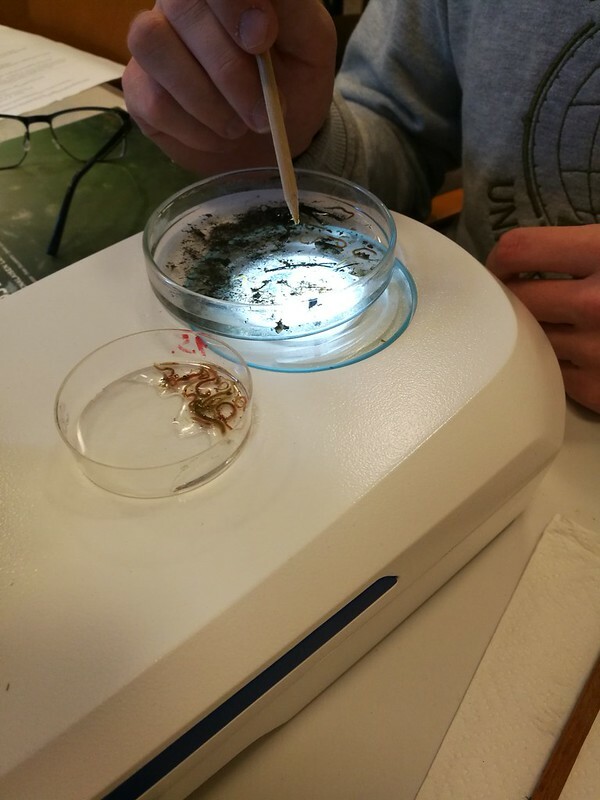 Soon after returning to Seili, the students started identifying macrofauna from the sediment samples. And how many interesting species there were! Especially polychaetes became familiar – Marenzelleria spp. abundances were at best up to 200 individuals/per sample. 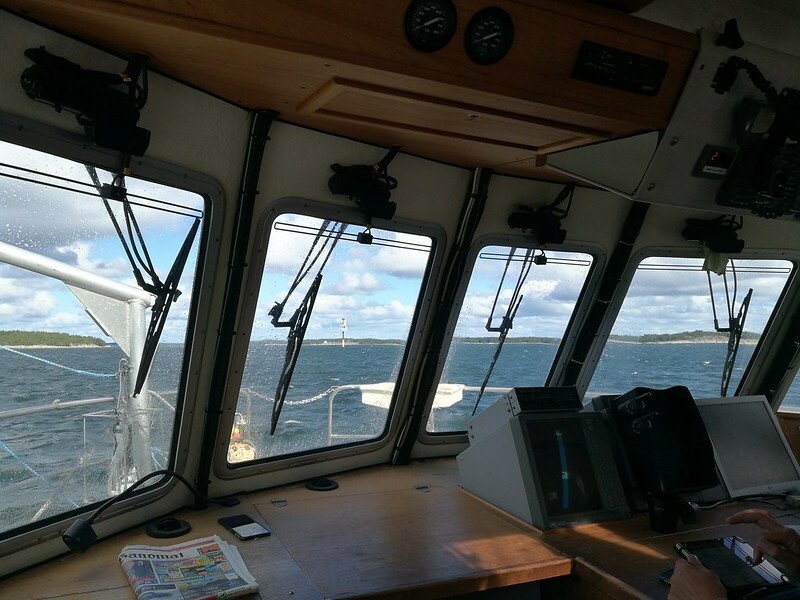 On Wednesday morning, on board of our Seili 5 vessel, we headed towards Iso-Kuusinen island in the middle archipelago. 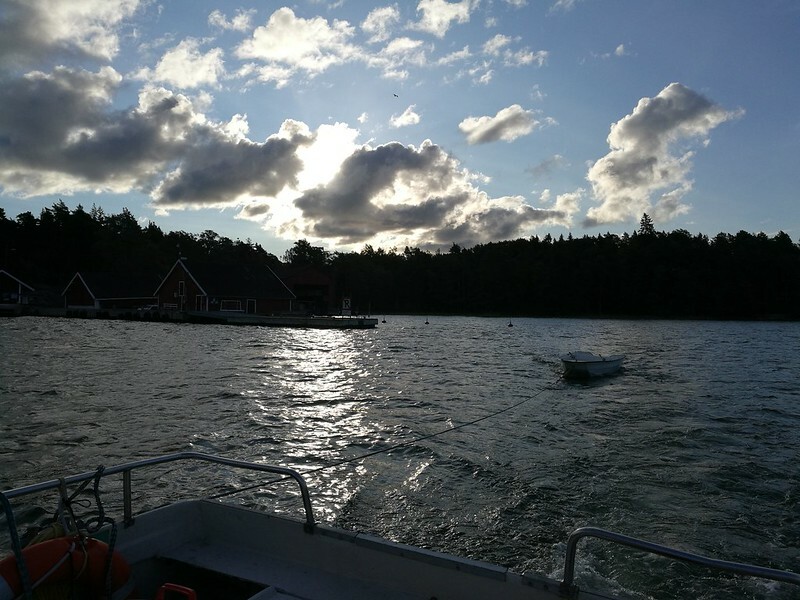 On our way to Iso-Kuusinen, we stopped to take samples at Päiväluoto, the Institute’s at-sea monitoring station where water and plankton samples have been collected since 1966. 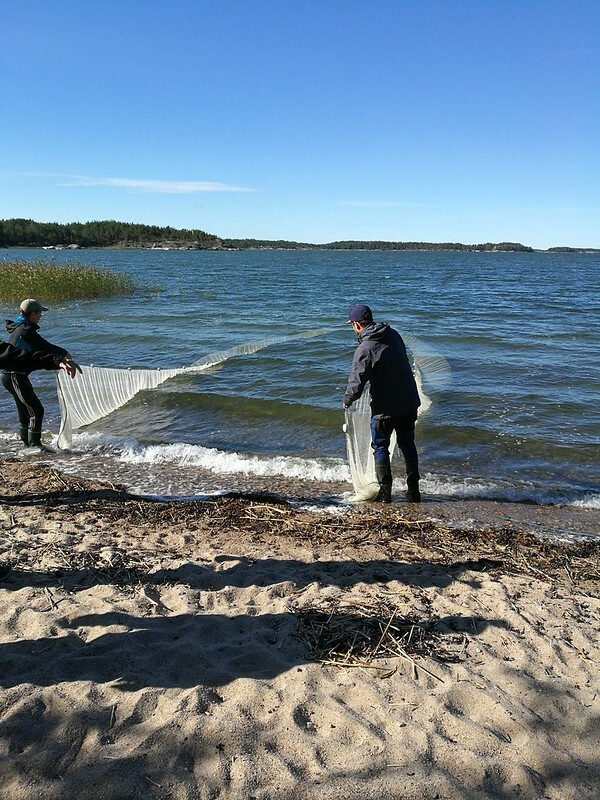 At Iso-Kuusinen, the students were introduced to a beach seine, a qualitative sampling method used to study especially fish, but also invertebrate and algal species in the littoral zone. What would a brackish-water course be without getting our feet wet (well, sort of). At the sandy beach, the students were sent hunting for burrowing clams. The final sampling exercise of the week was fishing. 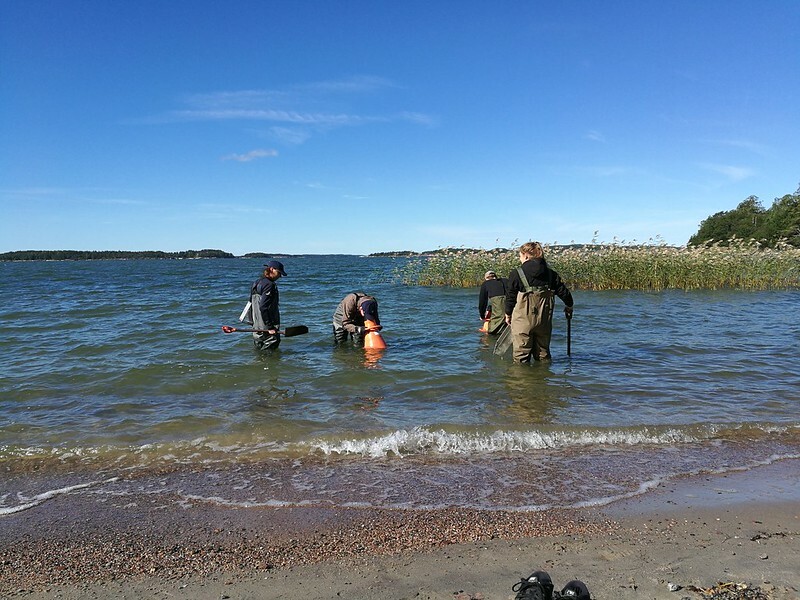 Nordic multimesh gillnets were set at three depths (surface, middle and bottom) outside Saunasaari island, in order to study the variability in fish species, their size, weight and location in the water column. The handling of nets went perfectly and we were not left empty handed! 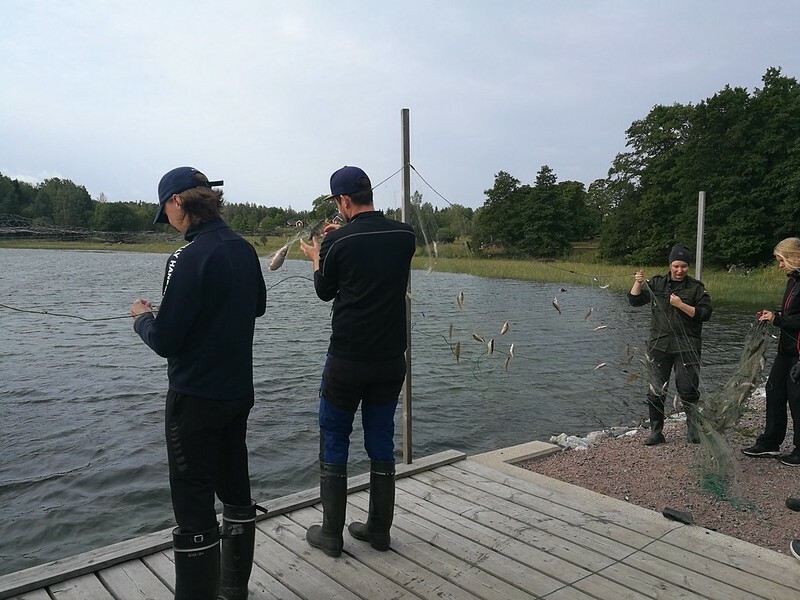 After measurements were taken, the fish were put to a freezer and are later send to the University’s Biology department for other students to study on.